I think the biggest reason may be our own insecurity. I mean, how many of us grew up writing our own musical compositions? How many of us include this as a musical activity in our lives and work today? Imagine if we did that with language: you learned how to read (and read expressively! ), but you never learned how to write down your own thoughts and ideas. Kind of hard to imagine, right? The ability to read and write music is an important part of being a musician and developing musicianship skills. How can you introduce composing and musical creativity to those you teach? Let me tell you about Compose Yourself - a fun, easy way to begin creating your own original music in minutes. Compose Yourself, created by composer Philip Sheppard, is a set of musical pattern cards (two sets of 30) designed to be manipulated and put into various sequences to create musical phrases and musical compositions. Each card has a unique 4-beat musical pattern. The cards are transparent so you can flip them horizontally or vertically to create different patterns. This gives learners the opportunity to create 120 unique patterns in all (four variations per card). Compositions may be anywhere from 4-16 mm. in length. Once you have a sequence of patterns in place, visit the website (from any desktop, laptop, or tablet with internet access), enter the access code included with your card set in the box that says "Enter code here to play!" and create a free account with your email address and a password. Once you've created an account, a new screen will appear with a blank musical score. Each pattern has a unique four-digit code printed on one corner. Type in the codes from the cards you have in front of you to create your first 4-measure sequence. On the website, you can flip the cards horizontally and vertically to create new patterns and drag and drop them to rearrange and reorder the measures. There are three playback options: solo marimba, orchestra, or solo marimba with orchestra accompaniment. The solo marimba (recorded by percussionist Evelyn Glennie) plays the melody you see on the cards, the orchestra (recorded live at Abbey Road Studios) adds harmonic support. Hear the cards played in order, as you have them entered, or click to select each pattern and listen to one measure/pattern at a time. Once you’re happy with your composition, add a title and your name as the composer, then download an .mp3 file (desktop/laptop only) of your composition and print out a musical score (Please note: the card numbers will be printed on the score so you have a record of the patterns used). All compositions created using Compose Yourself cards are licensed under the Creative Commons Attribution-NonCommercial 4.0 International License. However, for the purposes of introducing composing and giving learners a chance to experiment and explore musical creativity in a tangible way, this is a great resource. 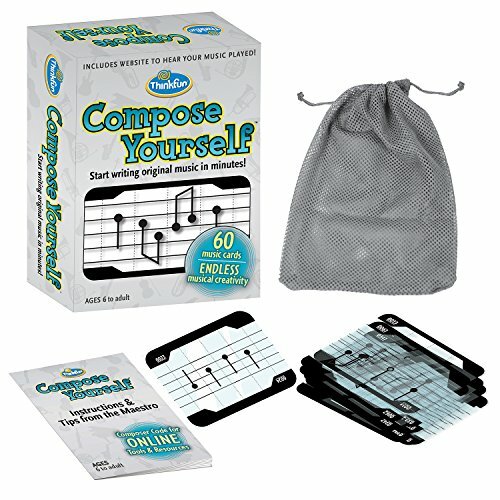 Compose Yourself is intended for ages 6 to adult. Use it in your private studio, elementary music classroom, children’s choir, youth choir, and even with adults who have an interest in exploring musical creativity and composition. How can I use it in my teaching? This is a great tool for encouraging musical creativity and introducing composition in a fun, experiential way. Use it as a gathering activity for your younger or older elementary children’s choir, a creativity project in a studio or group class or during a Music & Arts Week, or one-on-one in a private lesson setting (all ages). You could also use it with older children, youth, and even adults who are hesitant about being creative or unsure of how to get started. Have you used Compose Yourself in your teaching? I'd love to hear about it!